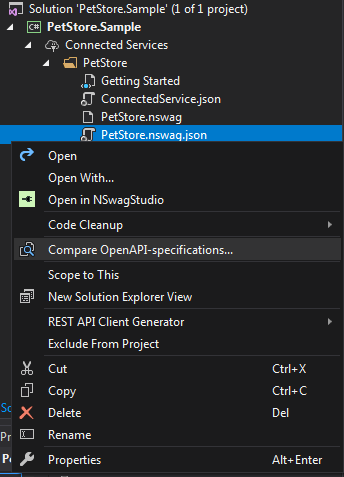 Unchase OpenAPI (Swagger) Connected Service is a Visual Studio extension to generate C# (TypeScript) HttpClient (Controller) code for OpenAPI (formerly Swagger API) web service with NSwag. The project is developed and maintained by Nikolay Chebotov (Unchase). Since v1.1. * have been added menu command embedded in Visual Studio Solution Explorer context menu lets you open generated .nswag and .nswag.json files in NSWagStudio. This extension is for those times where you generate .nswag and .nswag.json files and you want to be able to quickly open it in NSWagStudio. In order to use this extension, you must have Visual Studio 2017/2019, this connected service as well as NSWagStudio installed. If you installed NSWagStudio at a non-default location, a prompt will ask for the path to NSwagStudio.exe. Since v1.2. 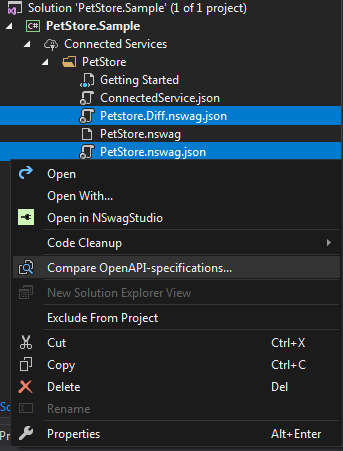 * have been added menu command embedded in Visual Studio Solution Explorer context menu lets you compare generated .nswag.json specification-file with another .nswag.json specification-file (or with specification given by endpoint). This extension is for those times where you generate .nswag.json file and you want to quickly compare it with another or specification given by endpoint. In order to use this extension, you must have Visual Studio 2017/2019 as well as this connected service. Relevant bug report. Connected Services will be restored in the first update to Visual Studio 2019 (version 16.1). Please feel free to add your review, request a feature, report a bug or ask a question. Thank you in advance! Copyright © 2019 Nikolay Chebotov (Unchase) - Provided under the Apache License 2.0.